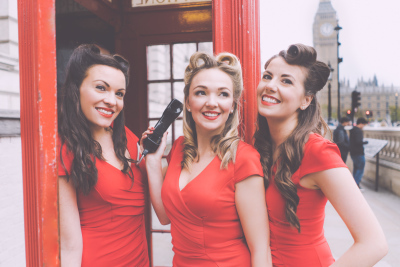 The London Belles are London's premier Vintage Vocal Trio, who put the chic into your favourite antique classics and a unique post-modern twist on contemporary pop hits. Originally hailing from England, Ireland and Wales, these starlets joined forces in London where they discovered their mutual love of everything red and everything vintage. With their seductively stunning vintage vocals, captivating close harmony and glamorous gowns, these vintage beauties are sure to dazzle and delight with their diverse and exciting repertoire ranging from timeless 1940's hits from The Andrews Sisters, to The Killers' 'Mr Brightside' with a Rat Pack twist. They'll sure give you 'Fever' with their sultry jazz standards and have you 'Crazy In Love' for their vintage Beyonce. From intimate cocktail parties, to decadent weddings, elegant soirees or large scale corporate events, these starlets are the perfect icing on the cake for any occasion. With their red lipstick, victory rolls and timeless Hollywood glamour, these London dolls are sure to take you toe-tapping right back to London of bygone years.